In this problem, you will verify statements made at the end of the power losses for Example 20.10. (a) What current is needed to transmit 100 MW of power at a voltage of 25.0 kV? (b) Find the power loss in a $1.00 \Omega$ transmission line. (c) What percent loss does this represent? This is College Physics Answers with Shaun Dychko. The power being delivered by a power plant is 100 megawatts which is 100 times ten to the six watts. The voltage is 25 kilovolts which is 25 times ten to the three volts. 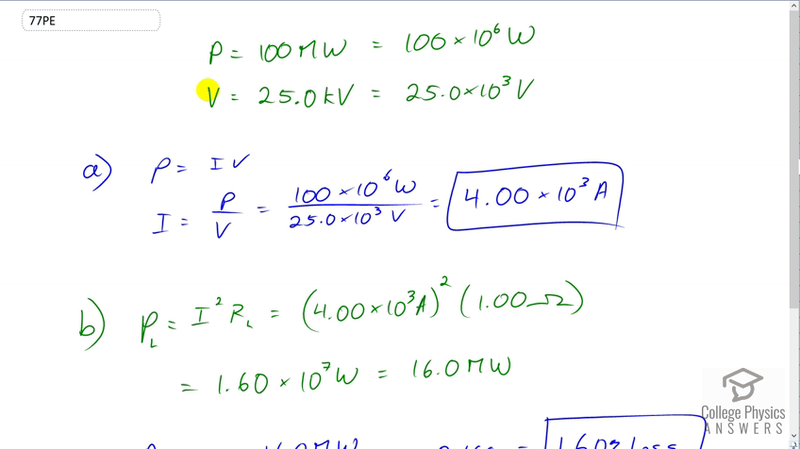 So the current that's needed to deliver that kind of power at that voltage is going to be the power divided by voltage which we get from the P equals I V formula after dividing both sides by V. So that's 100 times ten to the six watts divided by 25 times ten to the three volts, giving us four times ten to the three amps. I'm taking this to have three significant figures because, that we can let's assume has three significant figures. Then we'll figure out the power lost in the power lines that are transmitting this electricity and that loss is going to be the current which we just figured out, squared, multiplied by the resistance of the lines. So that's 4.00 times ten to the three amps, squared, times one ohm which is 16 megawatts. This represents 16.0 percent loss in power because we take the power lost divided by power delivered and the loss represents 16 percent of what's delivered.